Residents of Woodside, Queens, love where they live. They crow about the sense of community, the safeness, the good schools, etc. To the uninitiated, though, you have to squint a bit to see the charm. Woodside is notably lacking in green spaces or grand structures, and the housing stock is so ramshackle and just plain ugly, it could make Williamsburg look good. (Admit it: Williamsburg is homely.) But I've come to appreciate the place over the years. It is homey, and, as New York nabes go, completely without pretensions. Also, though its Irish roots show most vividly, it is a melting-pot community in the best sense. And the 7 line elevated tracks that cast its downtown in shadow give the place a distinctly old, working-class New York air. ORANGE HUT: We're going to start way out at the northern end of Woodside, at the Northern Boulevard stop of the R and V trains, where Northern meets 54th. Here is the singular Orange Hut, one of the best breakfast-and-lunch-only diners in the city. Also one of the cheapest. It began life as a White Tower Restaurant in 1930. PLAYBILL: Walk down 54th Street to 37th Avenue. Turn left and walk a number of blocks to 61st Street. Turn right here and you'll see a two-story, brick building with a familiar, big yellow sign on it saying "Playbill." 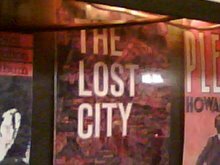 This is where the theatrical publishers make the programs that serve Broadway and Off-Broadway shows every day. ST. PAUL'S EPISCOPAL CHURCH: Walk along 61st to 39th Avenue. The sad, boarded-up church on the corner is St. Paul's, a Gothic Revival wooden church that was founded and built in 1874, when Woodside was little more than a kind of frontier town. It was—unbelievably—never landmarked, and suffered a terrible fire in December 2007. Its situation hasn't improved much since then. But at least it hasn't been razed. STATION CAFE: Keep walking on 61st Street, under the LIRR tracks. Just as you reemerge into the light again on the other side, you'll see this dive to beat all dives. The squat building with red-metal siding and a perpetually drooping awning has stood its ground here for 80 or more years, making sure Woodsidians are not denied beer at 9 AM. God bless its heart. STOP INN DINER: Pause at the corner of 61st and Roosevelt Avenue, the center of life in Woodside. Across the street is a diner with a punning name, the Stop Inn. It doesn't look like much, but most everyone in Woodside pays a call on this place once or twice a week. It's a standard diner, with fewer frills than most. But it truly grows on you. There has been an eatery at this corner since 1935, when Ray's Diner opened. V&V BAKERY: Turn left, back into the shadows of the elevated train tracks. A few yards east is the tiny V&V Bakery, which has baked bread and treats on this site for at least 40 years. Family owned as far as I can tell. 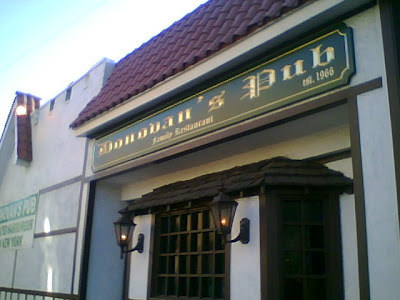 DONOVAN'S: Directly across the street from St. Sebastian's is a sprawling, one-story, white-sided building. Donovan's is Woodside's heart, if you ask me. It's been here since the 1960s, which, by Woodside standards, makes it fantastically old. And though Woodside has many, many Irish Pubs, this is its ur-Pub. It is absolutely comfortable inside. There are many rooms, but stick to the oldest of them, straight to the back as you enter, with the fireplace. Donovan's is renowned for their burgers, so give one a try. The Shepherd's Pie is good, too. MICHAEL SPILLANE: OK, a bit of a detour here. Turn left (south) on 54th Street to Queens Boulevard. Cross over and turn left to 59th Street, and turn right to No. 47-50. On May 13, 1977, Michael Spillane, former leader of the Westies Gang, was murdered outside this building, where he lived. Spillane had fled Hell's Kitchen for Woodside when his authority in Manhattan was brutally challenged. The move didn't save him, though. 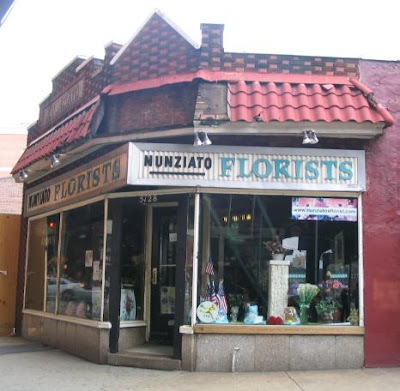 NUNZIATO FLORIST: Get yourself back to Roosevelt, turn left and walk to No. 5128. The family-owned Nunziato has been around since 1901. The cramped, oddly shaped building, forever enveloped in darkness, is a poignant sight. City Councilman Eric Gioia is a scion of the Nunziato clan. The St. Sebastian's building was originally Loew's Woodside, built in 1926. Very nice. I spent 10 of my childhood years living in Woodside. I don't think back then (late 60's/early 70's) the schools were considered good and I didn't know anybody who went to public school while I lived there - everyone was in parochial school of some kind including the neighbor kids and the various babysitters I had over the years, and myself. Well Jill if you went to St Sebastian School we must have know each other '68-70. mrs fitpatrick. Fr Burns. counting the collection money on Sundays. racing our bikes down skillman avenue. So sorry to see the church is so damaged, but glad to see it still exists. had some really good memories of the V&V bakery"crumb cake" i remember all those neat churches throughout woodside neighborhood, st pauls was near the 39th avenue neighborhood, back there, we use to buy our school supplies at was it called barco's? I have great memories of Woodside, My grandma lived on 63rd street one sideof the street Irish the other Italian. We used to go to my cousins Steak House on Roosevelt Ave though I can't remember the name of it. She passed away in 1970 and I haven't been back since then. Soemday I will have to return. Maura, was it Riordan's Steak House, on Roosevelt and just off 64th? I lived in Woodside for about six years before we moved, and we loved, loved, loved going into Riordan's - for either a pint or for dinner. Ahhhhh...how I loved living in Woodside. 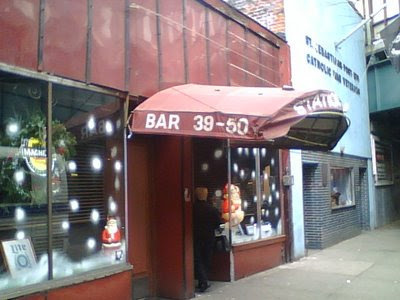 Loved to stop in at the Stop Inn - yes, definitely at least twice a week. And also the Rainbow Diner (wonder if that's still there?) and went to the Woodside Inn (formerly Toucan Tommy's, I think?) and Shane's Bakery, and of course, the very Irish 61st Street Deli as well as my favourite, favourite, favourite pizza place (okay...right up there with VIP Pizza in Bayside and Napoli's in Little Neck/Great Neck) was Peppino's Pizzeria. Amazing, gorgeous, beautiful slices and pies...and heroes and calzones! And is the Rainbow Pet Shop still there, I wonder, too? Great Chinese takeout across the street from Riordan's was Red Apple. Gorgeous General Tsao's chicken. Ahhhh...the V&V Bakery. 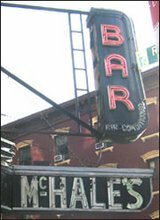 Always stopped in there on my way to work if I went into NYC via the LIRR rather than the Q32. I really, really loved Woodside. I really, really miss Woodside. I miss Queens. I see alot of old-timers have posted on here, so I want to give you an update on some of the old spots you mentioned. I have lived here only seven years, but the house I live in was built by my husband's great-grandfather around 1900. Our three year old son, is the fifth generation of men in his family to be born here. ZARCHY'S is still here. ALthough, I have seen pics where it was on the corner of 61st & Roosevelt. It is now on Roosevelt bet. 57th and 58th. My husband has mentioned a Steak House to me (Woodside?). I cannot remember - if it became Finnegans or Saints and Sinners (? ), but Finnegans - which was still here in 2006 - is now a dollar store - after having been about three different restaurants in the past seven years. Someone mentioned a movie theatre on Roos & 62nd. I am guessing that that is now the Fresh n Save (Key Food), actually a pretty nice supermarket. V & V is still here - the only Irish/Italian bakery left and I can't speak for its former quality, but other than bread and cookies (very good! ), their stuff is not so good. 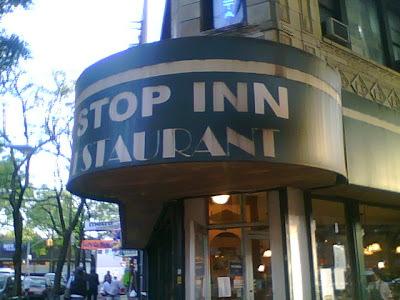 Stop Inn is still going strong and last week they were filming a movie starring Vincent Donofrio and Liam Neeson in there. At least five years after this original post, St. Paul's is in the exact same condition as the picture posted (if not worse). I am not even Christian, but I would love to see such a historic church fixed back up. I think the Bulova Watch dormitory was finally sold. 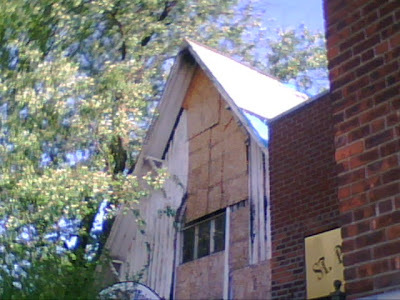 It had been boarded up for several years. I was just looking for it the other day, but forgot which block it was on. RAINBOW PET SHOP - well, I don't know if it is the same one, but there is one on 58th Street. It is a grooming place and sells food and supplies, but no actual pets. The owner is lovely. Someone mentioned going to the wooden P.S. 11. My father-in-law attended it. He is now 68. They are currently building an annex and a block away from the home you grew up on, a brand new P.S. is being built (39th Ave., from 57th to 58th) and slated to open in 2015. RAINBOW DINER? Not sure. But if it was on Woodside Ave, across from Ottomaneli's, it is still there, under a new name. I think that is the place as I vaguely recall it still being called the Rainbow when I first moved here. That is all i can think of now. It was fun to read everyone's comments about the places that used to be here. Rainbow diner is closed, so is Woodside inn and shanes bakery, and the pet shop. Peppinos is open still but gets shut down all the time for health code violations. Very dirty place. Woolworths between 65 and 66th(?) and Thom Mcans shoe store that went up in flames in, what 1966?